In my previous blog post Nature's Computation Needs Imply a Programmed Material Universe, I introduced a theory that the universe has a computation layer that includes software. My reasoning was based on the argument that we must assume such a layer in order to properly explain the incredibly high level of computation that nature is apparently doing all of the time. The reasoning I presented in that post was only half of the case for such a theory. The other half of the case (which this blog post will explore) is the need for such a theory to help explain the amazing and improbable evolution of the universe since the time of the Big Bang. I may note that this theory of a programmed material universe postulates that the universe is quite real and not any type of illusion (in contrast to theories imagining that the universe is merely a simulation, theories I reject). First, let us consider: if the universe does have a computation layer that includes software, how old is such a layer? If modern science told us that the universe existed for many billions of years in a state of complete disorder, and then gradually evolved over many, many billions of years to a state of somewhat greater order, then it might be plausible to advance some theory involving the gradual evolution of a computation layer within the lifetime of our universe. But that is not what modern science tells us about the past of our universe. Astronomers tell us that the universe began about 13 billion years ago in the Big Bang, a state of fantastically high density (indeed, infinitely high density if general relativity is to be believed). Cosmologists tell us that the behavior of the Big Bang was in several ways remarkably fine-tuned, and we know that nature has been behaving in an astonishingly orderly way from the very beginning. So if we are going to postulate a computation layer as part of the universe, we must assume that such a layer has existed from the very beginning, from the time of the Big Bang. 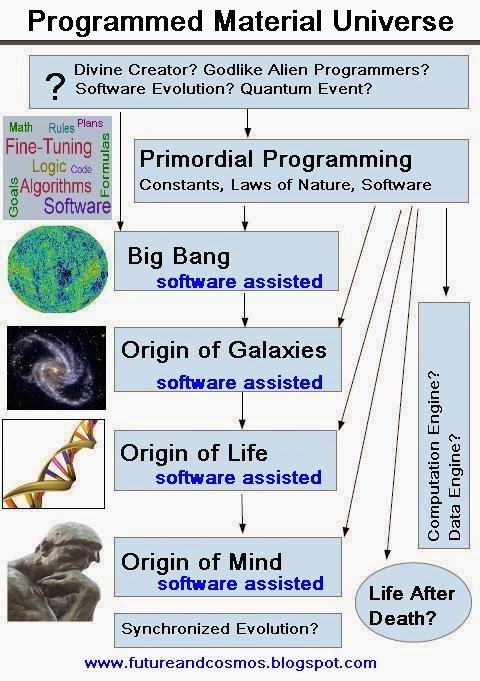 In this diagram we see one block marked “Primordial Programming” which includes constants, laws of nature, and software. The assumption of software existing from the very beginning is a new assumption made by the theory of a programmed material universe. Scientists have assumed that fundamental constants (such as the speed of light, the gravitational constant, and Planck's constant) have existed from the time of the Big Bang, and they have assumed that laws of nature have existed since the time of the Big Bang. 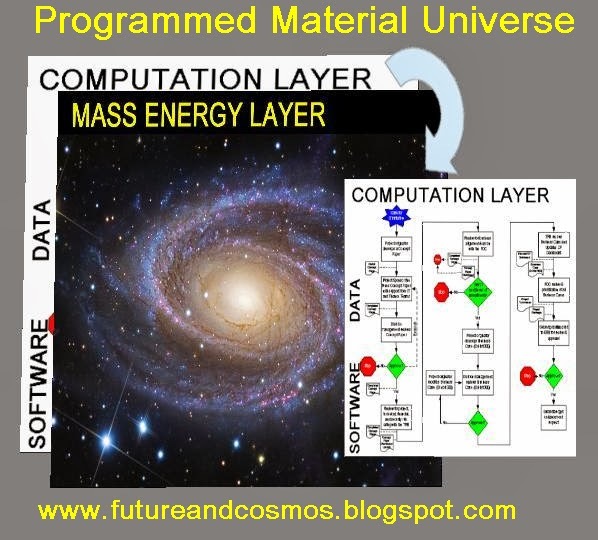 But the assumption that software has existed from the beginning is a new theoretical element characteristic of the theory we are discussing (the theory of a programmed material universe). I use the term software to simply mean programming. One way to define programming is processing that produces desirable outputs, typically from a set of inputs. There is probably a better and more general way to define programming, but that definition will do for the moment. Note that in this diagram I have a single rectangle that mixes together constants, laws of nature, and software. This is intentional, because we apparently need to imagine these things as being intermingled. Many of the laws of nature may need to be conceived as aspects of the software that has existed from the beginning, according to the theory of a programmed material universe. The fundamental constants of nature may also need to be conceived as elements that are part of the universe's software (just as constants are declared within computer programs). Purely for space reasons, the diagram depicts the Big Bang rectangle as underneath the Primordial Programming rectangle, but from a chronological standpoint we can imagine these both originating at the same time, at the beginning of the observable universe some 13 billion years ago (the Big Bang). Another diagram that illustrates the theory is the one used in my previous blog post, where I depict a computation layer co-existing with a mass-energy layer, as shown below. I mentioned that we should imagine these two layers as being intermingled (rather than one floating above the other). What Could Have Caused Primordial Programming? If we imagine that the universe has had from the beginning a computation layer that includes software, we then have the question of: where did this software come from? The answer given in the first rectangle of my first diagram is: unknown (as I indicate by using a big question mark). But I can briefly discuss some possibilities mentioned in the first rectangle of my first diagram. I discuss these reasons merely to show that there might be some explanation for why the universe might have a computation layer that includes software. One possibility is the idea that the computational layer was put in place by a divine creator, perhaps a being with some attributes of great power and wisdom, as imagined by quite a few theologians or philosophers. The fact that the theory of a programmed material universe may lead many to think of such a possibility is no defect of the theory as compared to the regular theory of a Big Bang, because the regular theory of a Big Bang is also suggestive of such a possibility. A second possibility is that the primordial programming may have been put in place by godlike aliens that arose in a phase of the universe prior to the Big Bang. General relativity indicates that nothing existed prior to the Big Bang, so this possibility is extremely speculative. 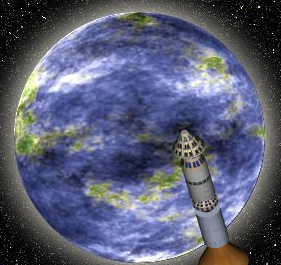 But if there was some existence of the universe prior to the Big Bang (unlikely as that may be), there conceivably could have evolved some civilization lasting millions of years, and the beings in such a civilization might have developed godlike powers from eons of technological development. Just conceivably, such beings could have caused our universe to acquire the programming that it seems to have. I don't consider this to be a very likely possibility, but I am mentioning it for the sake of completeness. A third possibility is that somehow the universe could have acquired its current programming (as postulated by the theory of a programmed material universe) through a process of software evolution that might have carried through one or more previous cycles or phases of the universe prior to the Big Bang. As someone who has written automatic code generators more than once, I know that software does not necessarily have to be produced directly by a conscious programmer. Very advanced software can also itself produce other software. So conceivably there could have been previous software in a previous cycle or phase of the universe (prior to the Big Bang), and that might have somehow spawned the programming that seems to have existed in our universe from the time of the Big Bang. A fourth possibility is the possibility that there simply was some ex nihilo quantum event that brought our current universe into existence at the time of the Big Bang, along with the programming that our universe seems to have had since that time. Such a scenario is admittedly farfetched, but it only seems to be slightly more farfetched than the notion that the whole physical universe could have popped into existence from nothing (a possibility that quite a few physicists take seriously). To accept the theory of a programmed material universe, it is not at all necessary to take any position on which of these possibilities is the correct one, or whether any of them is likely. We can simply leave the origin of the primordial programming as a great big question mark. That is pretty much what scientists do in regard to the Big Bang itself. Given this wide range of possibilities, only one of which is theistic, we can say that the theory of a programmed material universe is a religiously neutral theory, and that it does not at all require any belief in the current existence of any deity. It could be argued, however, that the theory is a somewhat “theism-friendly” theory. But you could say the same thing about the Big Bang theory itself, with its unexplained sudden appearance of the universe. You may note that in my first diagram there are four rectangles containing the phrase “software assisted,” one for the Big Bang, another for the origin of galaxies, another for the origin of life, and another for the origin of Mind. “Software assisted” here means the same as “aided by programming.” Why postulate that such momentous events were software-assisted? The software that we know of often tends to be goal-oriented. For example, when you go to the Amazon web site, you do not encounter software that is indifferent to whether or not you will place an order at that web site. Instead you encounter software that has a goal, which in this case is the goal of encouraging and recording some purchase by you. So if we assume that the universe has had very complicated programming from the very time of the Big Bang 13 billion years ago, it is reasonable to assume that such software is to some degree goal-oriented. This does not at all mean that we have to assume any self-conscious wishes in such software. Unconscious software can have goals. After I die there will still remain in my computer files some computer programs that have particular goals, but such programs will be utterly unconscious. But why is it that we might need to postulate that some primordial programming has assisted the universe throughout its evolution? The main reason is because of the great unlikelihood of the universe reaching so many milestones of success without any assistance from any such programming. Here is a quick summary of the amazing history of the universe. Thirteen billion years ago the universe starts out in the Big Bang, in a state of apparently infinite density (according to general relativity). The universe manages to expand at just the right speed for galaxies to successfully form, even though scientists say that what is called the critical density had to be fine-tuned to fifty decimal places (an issue known as the flatness problem). Somehow even though the opposite regions of the universe were causally disconnected, they managed to somehow conspire to expand at an amazingly coordinated rate (the horizon problem), leaving us with a universe that is remarkably homogenous and suitable for the evolution of life. Then much later, from this explosive event of unimaginable heat and density, there somehow arose not a ruined wreck resembling the aftermath of an H-bomb, but instead a very orderly universe consisting of galaxies, with most stars existing in beautiful spiral galaxies. Billions of years later, there then somehow arose from mere heat and chemicals the marvelous bit of programming called the genetic code, required before biological evolution can even begin. There then arose life. Then much later from mere unconscious matter there somehow arose a completely different type of thing: self-conscious mind, of the type humans have. This is a story of improbable success more mind-boggling than some Hollywood tale of a penniless street beggar marrying the princess of an exotic land. To make this story more believable, we need to postulate something extra. This is exactly what this theory of a programmed material universe can do, by describing a universe which had its evolution assisted by a computational layer that includes software that has existed since the beginning of the universe. It is true that scientists have some theories that attempt to explain some of the remarkable evolution of the universe. There is an inflation theory designed to reduce the fine-tuning of the Big Bang. There is also a “lambda cold dark matter” theory designed to explain the origin of galactic structure. There is an RNA World theory designed to explain the origin of life. There are also attempts to explain the origin of human mental faculties from Darwinian evolution (which often resort to arguing that man is basically just a chimp, or man is like a robot, or that self-consciousness is merely a by-product of brain activity similar to the gravy that is a by-product of cooking a turkey). But in general these theories are weak, cheesy, or insufficient. See my previous post We Do Not Understand How the Universe Came to Look This Way for a discussion of severe difficulties in the “lambda cold dark matter” theory designed to explain the origin of galaxies. See my previous post The Origin of Life: Programmatically Predestined? for a discussion of some severe difficulties in the RNA World theory, one of which is the near impossibility of explaining how the genetic code could have arisen through evolution from mere chemicals. See my previous post Darwinism Fails to Explain Man's Higher Faculties for a full discussion of the very great difficulty in explaining the origin of self-conscious Mind from mere natural selection (a point that NYU professor Thomas Nagel has argued at great length in his book Man & Cosmos). I have not yet got around to putting up a post devoted to making a critique of the cosmic inflation theory, but I will do so. The Princeton cosmologist Paul Steinhardt has made some quite severe criticisms of that theory, in articles such as this one. There are so many special requirements of the cosmic inflation theory (for an inflation phase to both begin and end successfully) that even if you accept it you are still left with a great deal of unexplained fine-tuning in the Big Bang. So we need something extra to explain the universe's amazingly successfully evolution from infinite density to planets where beings like us exist. The theory of a programmed material universe gives us that something extra. We can suppose that again and again throughout its history the universe has reached an outcome that was wildly improbable to occur by pure chance, because the universe behaved as it was programmed to behave from the beginning. But how is it that favorable events occurring in the universe's history could have been “software assisted” as I suggest in the first diagram? Think of it as I did in placing constants, laws of nature, and software in a single block labeled “Primordial Programming.” The three of these are intertwined. If there is programming behind the laws of nature (and if many of what we call the laws of nature or fundamental constants are simply aspects of that programming), then cosmic software or primordial programming is a kind of cosmic controller that can achieve any physical results. From this perspective, the programming doesn't have to follow the rules; instead the programming makes the rules, or to a large extent the programming and the rules are the same thing. So if we suppose programming has been behind the laws of nature from the beginning, we can envision that programming as a kind of teleological impetus that can achieve any physical result that is consistent with the programming itself. If there were no reasons for believing in such a theory other than the usefulness of such a theory in explaining the universe's evolution, and the appearance of life and self-conscious Mind, then there might not be a sufficient warrant for such a theory. But in my previous blog post I did explain many other reasons for adopting such a theory. In that post I showed that when we examine the computation requirements of nature, we find again and again that nature seems to be doing almost infinite amounts of rule-based computation, that often bears an uncanny resemblance to what we see going on in computer programs. We therefore have a full spectrum of powerful reasons for postulating this theory of a programmed material universe. I will now discuss two additional parts of my first diagram: the “Synchronized Evolution?” box and the “Life After Death?” box. Both of these are very much “luxury accessories” of the theory of a programmed material universe, not at all integral parts of the theory (rather like optional features you may choose when ordering a car from a car dealer). As for the “Life After Death” box, it is a fact that very many advanced software systems have a feature called auto-save, where the system says: I've detected something worth saving, so let me automatically save it. If we postulate that the universe has a built-in computation layer that includes software, it is then possible to imagine without too great a leap that the universe's primordial programming might include some functionality that automatically causes (or helps to cause) advanced consciousness to somehow survive death. From such a perspective it might conceivably be that life after death is just another feature in the feature set of the universe's programming. I will mainly leave it to others to debate how likely such a possibility may be, and at this time I have nothing but very vague thoughts about the matter. Another “luxury accessory” of the theory of a programmed material universe is the possibility of synchronized evolution. If we assume that the universe's evolution is being assisted and perhaps even controlled by some computation layer of the universe that includes software, it is possible that rather than occurring at random time intervals, the evolution of intelligent life may occur in a synchronized manner. The universe could be programmed for intelligent life to appear throughout it at the same time. There may be throughout the universe a target date for the evolution of intelligent life, some date close to the present. Why even consider such a possibility? The main reason is that such a possibility offers a new potential solution to one of the great mysteries of the universe: the “where is everybody?” mystery known as Fermi's Paradox. If intelligent life is appearing simultaneously throughout the universe, then the long-standing Fermi's Paradox mystery dissolves away, and we can say: they are not here, because they are no more evolved than we are. But I think this synchronized evolution possibility is somewhat unlikely, so I suggest it merely as an optional hypothesis. These two possibilities (life after death and synchronized evolution) are not at all predictions of the theory of a programmed material universe; they are merely possibilities that might be more likely if such a theory is true. One of the most important discoveries during the past 40 years has been the discovery of cosmic fine tuning, the many ways in which the universe seems to be tailor-made for the evolution of intelligent life. Scientists have been extensively discussing the topic for about 40 years, often while discussing what is called the anthropic principle. You can find a good introduction to the topic in this scientific paper and my long blog post Cosmic Fine Tuning Visualized. 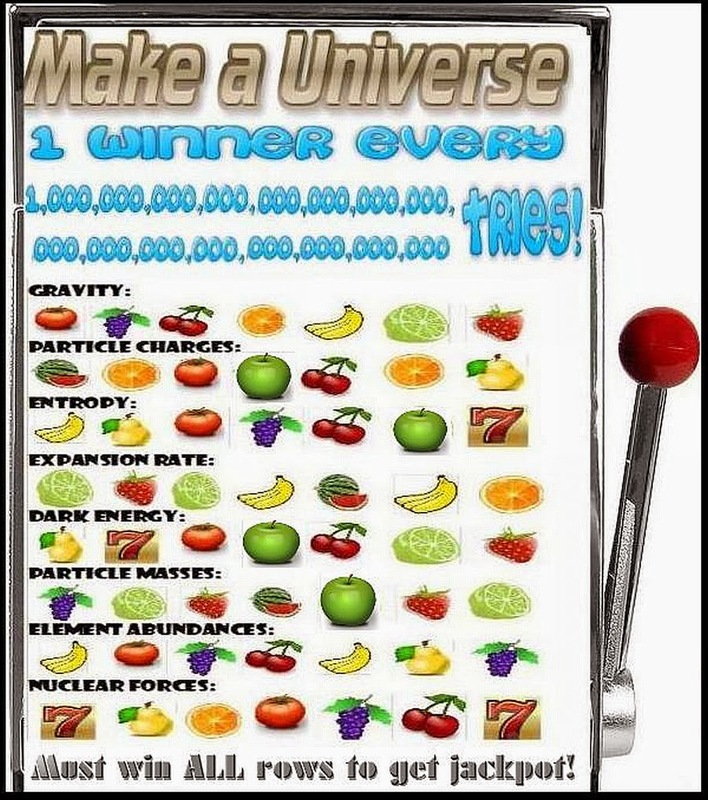 In that blog post I used a metaphor of a slot machine with 8 rows that must each have all matching symbols for the universe to be compatible with the appearance of intelligent life (the rows being labeled gravity, particle charges, entropy, expansion rate, particle masses, element abundances, and nuclear forces). The chance of pulling the lever and getting a match on all 8 rows is 1 in 1048, one chance in a trillion trillion trillion trillion. The discoveries about cosmic fine tuning don't fit in with the tendency of physicists to regard the universe as being a blind and random thing ruled by chance. Modern physicists have generally reacted to the discoveries of cosmic fine tuning with a combination of interest and complete bafflement, rather like a deer caught in the headlights. We are long, long overdue for a theory of the universe in which cosmic fine-tuning fits in naturally, rather than being some embarrassing exception that stands out like a sore thumb. The theory of a programmed material universe is such a theory. It meshes very well with what we know about cosmic fine-tuning. Fine-tuning is something that one expects to see in any good software system. So under a theory that the universe has a vitally important computation layer in which software is a very important part, we should expect to see cosmic fine-tuning. In fact, many of the things that are cited as cosmic fine-tuning may simply be considered aspects of the universe's built-in programming. Cosmic fine-tuning and a theory of a programmed material universe fit together like a hand and a glove, which is a strong advantage of this theory. The theory I have advanced here is clearly teleological, in the sense of imagining nature moving towards goals (not because it is self-conscious, but because it includes goal-oriented programming). But this teleological aspect is no defect in the theory. In his book Mind & Cosmos, NYU Professor Thomas Nagel (himself an atheist) argues with great force that reductionist materialistic explanations for the origin of life and the origin of human consciousness have been insufficient. Nagel argues that we need some new teleological theory, one that postulates "a cosmic predisposition to the formation of life, consciousness, and the value that is inseparable from them." Lengthy excerpts from his book are here and here. The theory I have advanced may fit most of his prescription.